If the concentration of dinos is low, the copepod eats them (these images are mine; similar ones in the article are protected by copyright). If the concentration of dinos is high, the concentration of toxin produced by them is also high. Then the copepod is paralized and gets eaten by the dinos. Essay for September 2012: Prey-predator flip? The present essay was motivated by a note, "Attack of the Killer Algae", in Science  in the section "Editors' Choice" which alerts readers to articles in other journals that are of note. 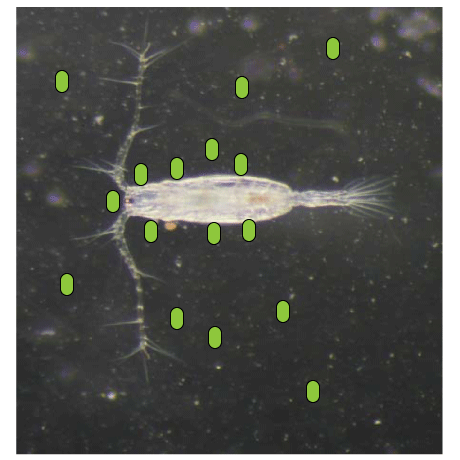 The article of note is titled: "Marine-micro algae attack and feed on metazoans" . There are two animals involved in this report. The copepod is a common marine species, Acartia tonsa. 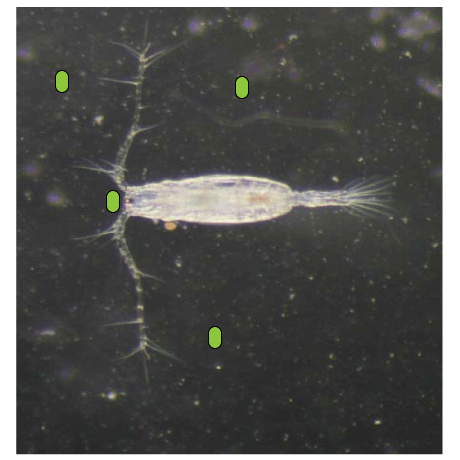 Copepodes in general, and this one in particular, eat diatoms and dinoflagellates predominately. The dinoflagellate genus Karlodinium often forms blooms (large concentrations) when conditions are good for their growth. Several species of this dinoflagellate release toxins into the water which paralyze or kill most animals in the neighborhood. The dinoflagellates then ingest (or absorb) degraded tissue from the animals. These dinoflagellates also contain chloroplasts; they can use sunlight for energy and biosynthesis. They are thus a good example of a generalist; sun or flesh, what ever is more plentiful. If the concentration of dinoflagellates is low the concentration of dino-toxin is low. Then the copepods eat the dinoflagellates; that's what copepods do. If the concentration of dinoflagellates is high, the concentration of dino-toxin is high and animals in the neighborhood are immobilized and digested by the dinoflagellates. This includes copepods. So there is a switch of sorts, but there is not much mystery to the mechanism. Attack of the Killer Algae. Science, 18 May 2012, Vol 336 pg 780.